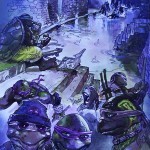 You’ll notice that that’s “Raptor Raph” down there at the bottom. 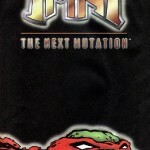 This was one of very few official promotions released for “TMNT: The Next Mutation” (you’ll see another in a moment), exhibiting that, for at least a brief span of time, the film was considered a “sure thing”. 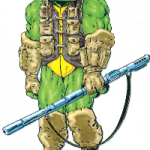 It’s doubtful that Kirby would have been a cyborg in the film, as Playmates had a habit of subjecting the Turtles to all sorts of indignant outfits that neither reflected the content of actual TMNT media, nor the tastes of the toy-buying public. 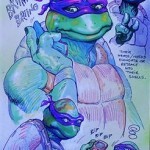 Still, he’s kinda cool-looking. 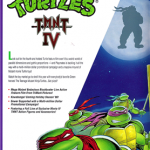 Playmates seemed pretty certain this film was on the way (listing Trimark as the distributors), readying the toy-hungry public for their exhaustive wave of “TMNT IV” merchandise leading up to the 1996 holiday season’s release of the film. 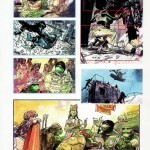 Well, that never happened. 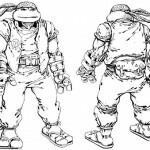 Exactly how much “TMNT IV” merchandise made it to the test production stage is unknown, with only the aforementioned “Cyber Kirby” toy being revealed to the public as a potential release (I imagine a “regular” Kirby would have filled out the line along with versions of the Turtles with their secondary mutations). 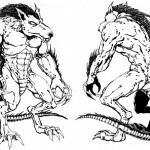 Precisely what they meant by “parallel dimensions” and “gothic proportions” is a mystery to me, at least in relation to Laird’s info about the proposed film’s plot. 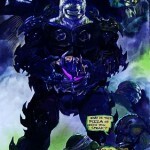 Did Kirby come from a parallel universe? 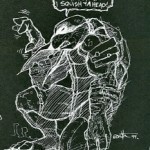 We’ll probably never know. 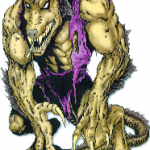 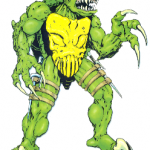 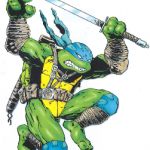 The secondary mutations, particularly the hideous and feral concept of “Raptor Raph”, found new life in the 9th (1995) and 10th (1996) seasons of the Fred Wolf TMNT animated series, where their “unstable mutations” were the source of a story arc beginning with the episode “The New Mutation” and not resolved until the episode “The Beginning of the End”. 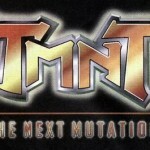 After “TMNT: The Next Mutation” was rejected and chopped up for spare parts, another attempt at a 4th film was made in 2001, aimming to produce a completely different type of Ninja Turtle flick. 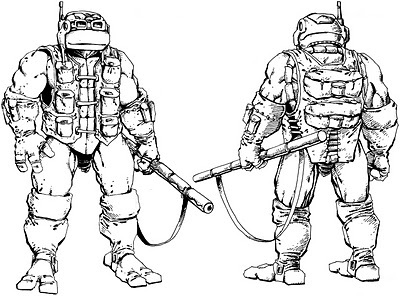 Aside from the numerous pieces illustrating the Turtles garbed in normal outfits and interacting with humans (reposted here is only a sampling of the artwork; for the full gallery, go to Brendan McCarthy’s homepage linked at the end of this article), the only unifying tidbit amongst the sketches is a mysterious, sinister-looking Turtle of gargantuan proportions, clad in what looks like modified Shredder armor. 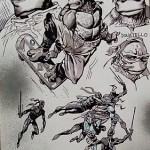 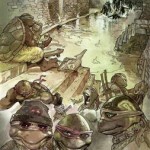 Shades of Raphael’s turn as Shredder from Image’s TMNT Volume 3 series, or perhaps a new take on “Kirby”? 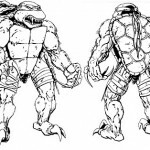 Intended as a live-action endeavor (if the notes on the concept art are to be believed), it was never-the-less rejected and Imagi’s bid eventually won out, resulting in the 2007 flick that nobody bothered to go see in the movie theater. 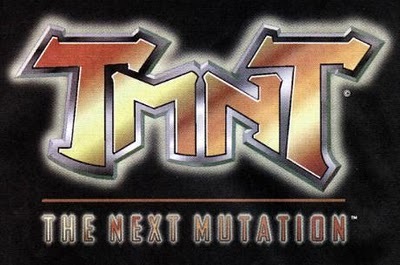 As cool as some of that Eastman/Laird art for “TMNT: The Next Mutation” may be on the surface, the one thing we should all bear in mind is that this was intended to be a live-action film made in 1994. 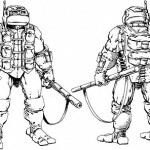 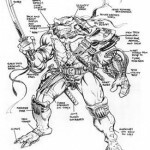 Jim Henson’s Creature Shop had already abandoned the franchise following “TMNT II: Secret of the Ooze”, so the costumes and animatronic effects for the rather ambitious scope of “TMNT: The Next Mutation” likely would have fallen on the studio that did “TMNT III”… The All Effects Group.